Plant trees! People are the backbone of our operation and last planting season 6,836 of you volunteered 36,776 hours to help green our region. Join us as a volunteer this season for our biggest year yet! Lead a crew. Crew Leaders plant trees, teach others, play outside, develop skills, and make a long-lasting contribution to our region's urban forest and native ecosystems. We are hosting multiple Crew Leader trainings this fall, learn more and register here. Get a tree. 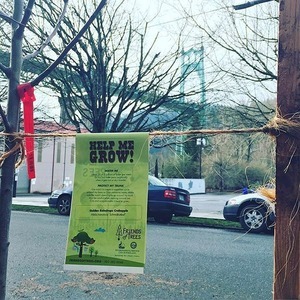 We'd love to plant a street tree or yard tree with you. If you live on Portland's east or north side, in Clark County, Lane County/Eugene/Springfield, Oregon City or Vancouver, you may be in our target planting area. Find out more here. Donate. Yes, volunteers make our world go 'round, but your donation helps put trees in the ground. Thank you! We watered. We pruned. We mulched. We visited and assessed. Our tree care may not be as well known as our plantings, but it's super-important. We want all those trees we plant to make it and to thrive. So we spend summer months caring for the trees planted in natural areas and visiting & assessing newly planted neighborhood trees. All told, we cared for and/or assessed more than 53,000 trees this summer alone! Another thing: We'll do this for trees planted in natural areas for the first 10 years they're in the ground. We also had a great crew who knocked on lots of doors, spreading the word about how awesome & easy it is to add a tree or two to your yard. And we accompanied Garry to street fairs galore. Check it all out. Join us to learn about exciting new nature and health research that impacts our community! 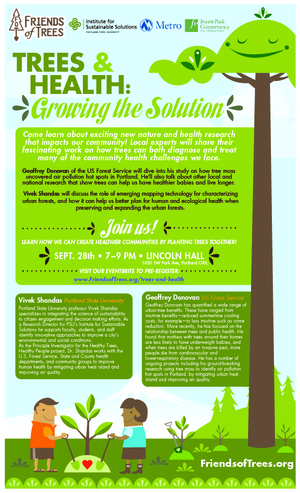 Local experts will share their fascinating work on how trees can both diagnose and treat many of the community health challenges we face. Geoffrey Donovan of the US Forest Service will dive into his study on how tree moss uncovered air pollution hot spots in Portland. He'll also talk about other local and national research that show trees can help us have healthier babies and can aid in living a longer life. Vivek Shandas will discuss the role of emerging mapping technology for characterizing urban forests, and how it can help us better plan for human and ecological health when preserving and expanding the urban forests. Space is limited, please register for this event here. Attend the forum on August 31. This Sunday, June 26, I'll be hosting a town hall at Corbett Elementary School in Corbett. I invite all Multnomah County residents to come and discuss what we need to do to strengthen our state and our nation. Also, if you are running into red tape accessing veterans benefits or dealing with Social Security or Medicare, or having trouble getting what you need from other federal agencies, I will have a caseworker on hand who may be able to help. To learn more about this town hall or any future events, please visit my website at merkley.senate.gov and stay engaged on Twitter. You can also like my Facebook page and follow me on Instagram to see more behind-the-scenes content! Thank you, and I look forward to meeting you. Yesterday, Portland's City Council unanimously voted "aye" on the 2035 Comprehensive Plan.